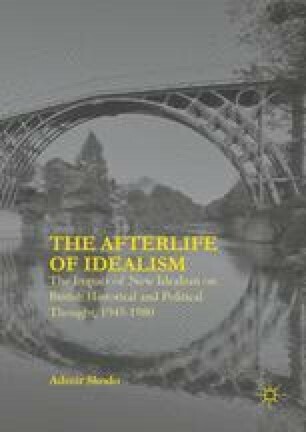 Understanding what place the late Victorian absolute idealists (most notably T.H. Green, Edward Caird, Bernard Bosanquet, F.H. Bradley, William Wallace, Henry Jones, D.G. Ritchie) accorded to historical knowledge in their philosophy has proved to be a non-starter. For some scholars, these idealists’ belief in abstract principles and concepts, such as ‘Absolute Mind’, as the metaphysically necessary forms for the self-realization of individuals has occluded an interest in the contingency and cultural plasticity surrounding the lives of humans. This, in turn, has constrained the development of any serious historical theory, much like it has constrained the development of British sociology. Thus, Stefan Collini writes: ‘Bosanquet and the English Hegelians for the most part ignored the historicity of phenomena, a failing for which they were later castigated by Collingwood, the one English Idealist to repair this omission.’ This chapter examines the shift from a metaphysical absolute idealism to a historicist new idealism, teasing out the implications thereof for postwar revisionist historiography.